What does it feel like to jump out of a plane and fight a forest fire with only your tools and your wits about you? Or work a year’s worth of hours in only six months, sleeping in the dirt alongside twenty other people? How about felling a burning tree 150 feet tall? Can you imagine working alongside flames taller than your average office building? 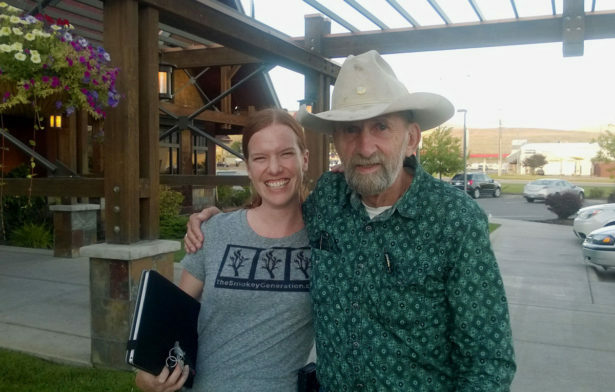 Short of quitting your job and starting a new career in firefighting, the best way to experience wildland fire is to hear it from the experts—from firefighters themselves—and The Smokey Generation makes that possible. It is a celebration of wildland firefighters telling stories that ignite the imagination, provide intriguing perspective, and highlight the fascinating culture of the wildland fire community. Camp Menard (Ninemile) Ford Trimotor. 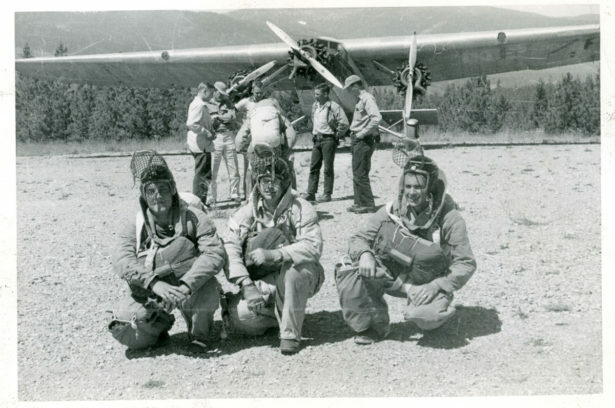 1st Jump Bob Conklin on left. Photo contributed to Smokey Generation by Leonard Blixrud (MSO 1953). The Smokey Generation – TheSmokeyGeneration.com – is a passion project I founded as a former wildland firefighter and owner of Wildland Fire Careers. The website was created as part of my thesis project for my Master of Arts degree in Environmental Studies – with a concentration in wildland fire management and communications. The goal is to collect and share stories from wildland firefighters throughout the country so that we can preserve the history and culture of the wildland firefighting industry and stimulate discussion about wildland fire itself. Last summer, MYSTERY RANCH sponsored The Smokey Generation to attend the 75th anniversary of smokejumping, a national reunion – held in Missoula, Montana – with more than 800 current and former smokejumpers in attendance. Smokejumpers are a select group of wildland firefighters who parachute into remote areas to suppress wildfires. 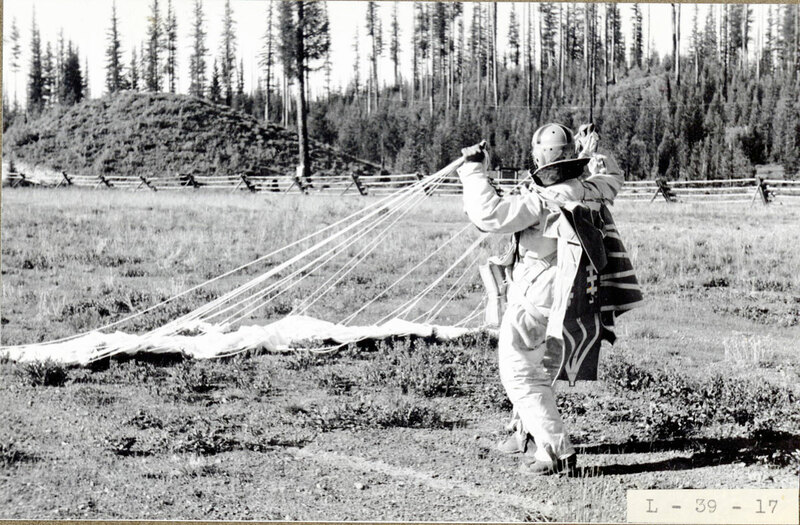 Stories representing every decade from the 1940s to present were collected during the weekend, becoming the project’s new Smokejumper Collection; it was a phenomenal opportunity to capture, preserve, and share the rich histories and engaging stories of these elite men and women. 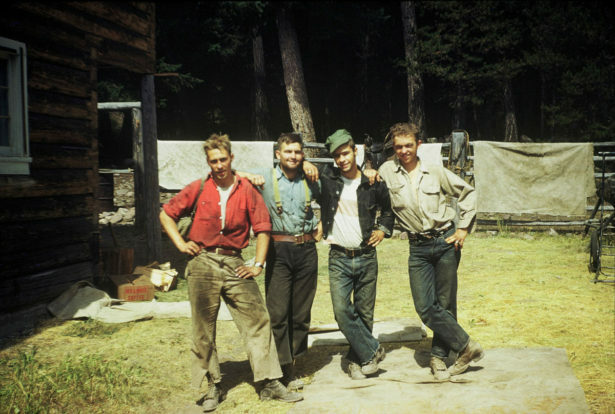 Jumpers at Spotted Bear Ranger Station after a fire 1953. Photo contributed to the Smokey Generation by Don Halloran (MSO 1953). In addition to the Smokejumper Collection, TheSmokeyGeneration.com provides anecdotes, lessons learned, and cultural reflections through its unique interactive Talking Maps, ConTEXTualized Stories, and more. You can watch wildland firefighters describing close calls, showcasing their camaraderie, and exploring their various histories. It also provides an opportunity for us to examine our relationship with the natural world, exploring the important role wildland fire plays in keeping our landscapes healthy and beautiful. Jim Waite at Seeley Lake in 1940. Photo contributed by Chuck Sheley. Through continued support, MYSTERY RANCH helps The Smokey Generation showcase the wildland fire community in an authentic, meaningful, and unique way, and at same time, helps to preserve this irreplaceable wildland firefighting history. As we enter into a new fire season, look for The Smokey Generation to bring you great new footage, photos, and stories from the fireline. Bethany Hannah, founder of Smokey Generation, and Jeff Davis, Missoula Smokejumper from 1957 through 1978.